Macy's cut its holiday forecast. So why is the stock rallying? 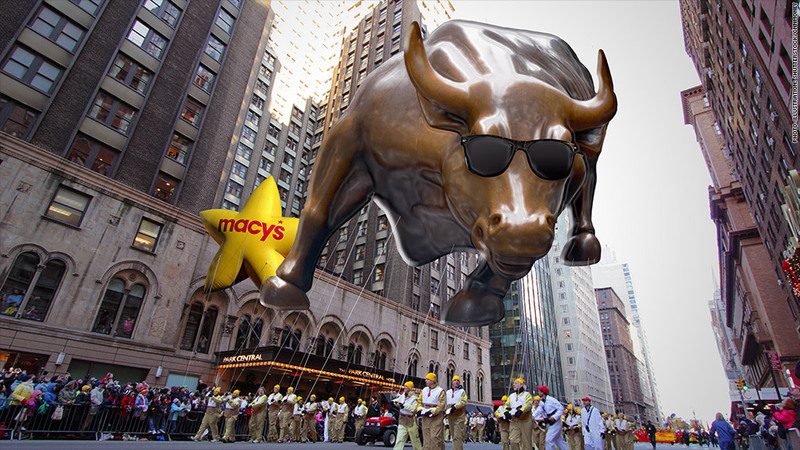 The Macy's Thanksgiving Day Parade should have a stock market themed balloon: a bull with blinders on it. Shares of Macy's (M) popped 4% Wednesday morning even though the retailer lowered its earnings outlook for the fourth quarter -- you know, that critical holiday period. Sales for the third quarter missed forecasts too. What the heck? Are investors hitting the spiked eggnog a little early? Macy's is perhaps the most iconic retailer in America when it comes to holiday shopping. In addition to sponsoring the big parade on Turkey Day, Macy's is also the setting for the classic 1947 movie "Miracle on 34th Street" that featured a young Natalie Wood. Bad news is good news for retail sector? So if Macy's is telling Wall Street that it expects a softer fourth quarter, shouldn't that be a problem for it and the rest of the retail sector? Weak forecast? No problem! Macy's stock flies high. Several traders on StockTwits admitted they were surprised that the stock was higher. "Market is immune to Macy's terrible guidance," wrote strategymizer. $M sales were bad and they r going to be bad in the near future...okay let's buy it," added rapture133. Macy's wasn't the only retailer that was rallying Wednesday. Shares of struggling department store chain J.C. Penney (JCP), which will report its latest results after the closing bell, were up more than 4%. Kohl's (KSS), Dillard's (DDS), Nordstrom (JWN) and the broader SPDR S&P Retail (XRT) exchange-traded fund were all higher as well. But one trader worried that retailers are going to run aggressive promotions just to meet sales targets ... no matter what they wind up doing to profits. "There u go. Nothing matters other than driving retail stocks higher. Mkt is insane. Margins will be crushed to make holiday #," quipped mytfine. 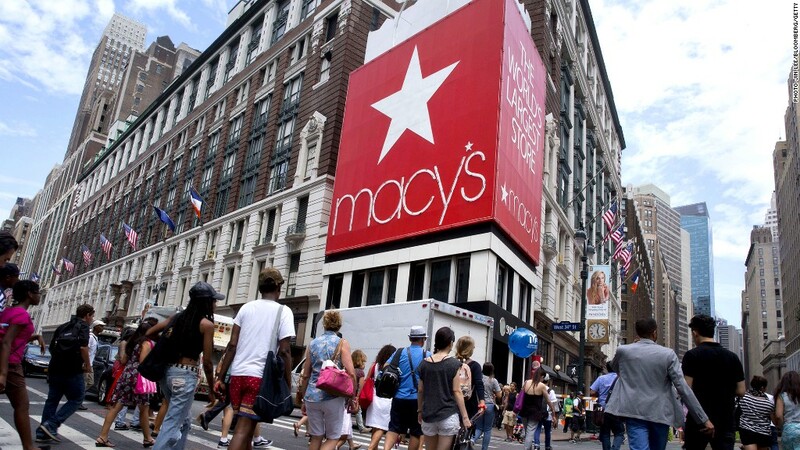 Still, it is worth noting that Macy's earnings for the third quarter blew away forecasts. So investors are probably excited by that. Macy's CEO sounds excited: Even though the company did cut its 2014 earnings forecast from $4.40 to $4.50 a share to a range of $4.25 to $4.35, it would be a mistake to say that Macy's is struggling. If Macy's hits the midpoint of its new target, that would still be about an 8% increase from last year's earnings. Not fantastic, but not a disaster either. Related: Are stocks too expensive? "An outstanding merchandise assortment for holiday gift-giving"
New marketing strategies such as the Buy Online Pickup in Store for Macy's and Bloomingdale's locations as well as Same Day Delivery pilots in eight Macy's markets and four Bloomingdale's markets. "A return to more normalized weather patterns after the unusually severe snowstorms in the fourth quarter last year." That last line is pretty amusing. Retailers are often quick to blame bad weather when sales go into a tailspin. So it seems that Lundgren is doing his best meteorologist impersonation and hoping that there will be no major storms in early-to-mid December like last year. Of course, predicting what the weather will be like a month in advance is as hard to do as predicting where the stock market will be in a matter of weeks. But investors are in a forgiving mood. One trader summed it up best: Lundgren's words wound up speaking louder than the awful numbers. "$M despite the negative report, and it was negative, the shares are up, market must just like the CEO's tone..." said obdurate_trader.